The Sugarbirds are a small family of African passerines. These are just two species of sugarbirds (genus Promerops) endemic to southern Africa. Perhaps the best known is Cape Sugarbird (male [left] and female [below]). Males have dramatically long tails that blow in the breeze; females also have long tails but nothing like the very long tails of males. They have brush-tipped tongues to consume nectar, and overall they resemble a very large and long-tailed sunbird. Cape Sugarbird is a resident endemic in the Fynbos biome, centered on the Western Cape Province of South Africa, extending eastward into the Eastern Cape Province. The range of the other sugarbird — Gurney's Sugarbird Promerops gurneyi — extends from the mountains of the Eastern Cape Province, South Africa, to eastern Zimbabwe and adjacent Mozambique. 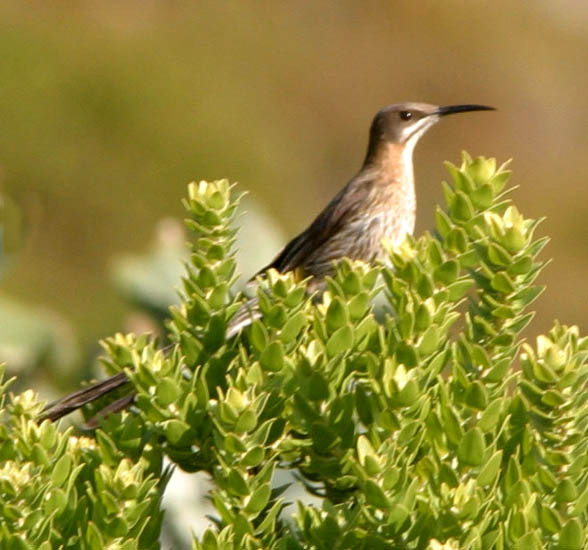 Both sugarbirds "live in close association with protea scrub, where they are dependent on nectar for food. The genus Protea belongs in the Protaeceae, a plant family virtually confined to the Southern Hemisphere. Africa is home to well over 100 species of protea, 91 of which grow naturally in southern Africa" (de Swardt 2008). The close association of these sugarbird species to specific plants recalls the close association of various hummingbirds with New World flowering plants. 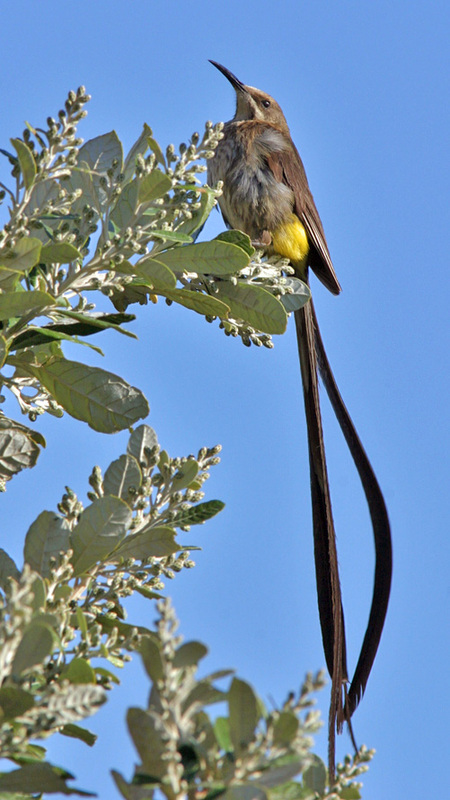 In the distant past, sugarbirds were thought to be related to Australasian honeyeaters because they both fed on nectar. Anatomical studies suggested a relationship to thrushes. Early egg-white protein studies — the forerunner to the DNA-DNA hybridization studies of Sibley & Ahlquist (1990) — found potential links to either specialized starlings or to sunbirds. It is now known (e.g., Beresford et al. 2005) that sugarbirds are an ancient basal lineage among the Passeroidae, with no close ties to any other major lineage in the group. These birds from sub-saharan Africa — each in a monotypic genera:Spot-throat Modulatrix stictigula, Dapplethroat Arcanator orostruthus, and Gray-chested Kakamega [aka "Gray-chested Babbler"] Kakamega poliothorax —had been considered babblers but molecular evidence showed that they were not (Beresford et al. 2005, Johansson et al. 2008). They apparently belong in Passerida, next to the sugarbirds (Beresford et al. 2005). For quite some time these three ground-dwelling skulkers were included in the Promeropidae (including in this project) until a greater consensus arose that they should be elevated to their own family; e.g., Winkler et al. (2015). Photos: The photos of Cape Sugarbird Promerops cafer come from vicinity of Walker Bay, South Africa, in March 2005. Robert A. Cheke, Clive F. Mann, and Richard Allen. 2001. Sunbirds: a Guide to the Sunbirds, Flowerpeckers, Spiderhunters, and Sugarbirds of the World. Christopher Helm, London. This is a very nicely done "family book" — actually, a three-family book — in the Helm Identification Series. In standard format, the first half of the book is color plates with facing text on plumage characters and i.d. points, plus a good showing of subspecific variation. The second half is the main text with range maps, detailed descriptions, full discussion of subspecies, habitat, food, and breeding biology. All these topics are given in short summary fashion, but provide a fine overview. The two sugarbirds are a very small part of this book, and they did not anticipate that the spot-throat et al. might be related, but this was before molecular evidence was available. Overall the paintings are crisp, clear, and useful, and the text a good summary on many topics. Cheke, R.A., C.F. Mann, and R. Allen. 2001. Sunbirds: a Guide to the Sunbirds, Flowerpeckers, Spiderhunters, and Sugarbirds of the World. Helm Identification Guide. C. Helm, London. de Swardt, D.H. 2008. Family Promeropidae (Sugarbirds), pp. 486–497 in Handbook of the Birds of the World (del Hoyo, J., A. Elliott & D.A. Christie, eds). Vol. 13. Lynx Edicions, Barcelona, Spain. Fjeldså, J., M. Irestedt, P.G.P. Ericson, and D. Zuccon. 2010. The Cinnamon Ibon Hypocryptadius cinnamomeus is a forest canopy sparrow. Ibis 152: 747–760.